I will strengthen you for the journey that lies ahead of you, says the LORD. You need not grow weary or suffer burnout, because you are overwhelmed and overburdened. Cast all your burden upon Me, for it is My easy yoke and light burden that I have for you. As you wait on Me, your strength will be renewed. You will not become weary, but you will be enlightened and energetic. 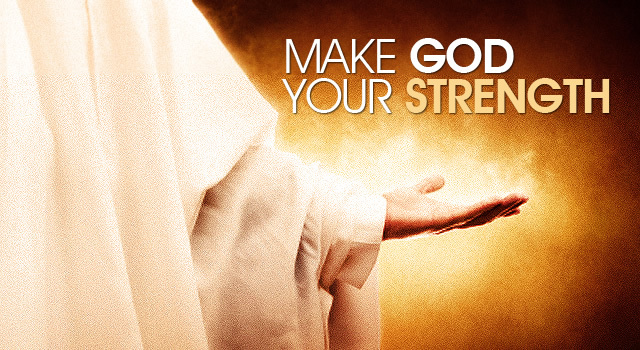 I will make you strong and steady on your feet, as you stay focused upon Me, says the LORD. Don’t allow your circumstances to dictate to you or alter your course, says the LORD. The enemy will always run resistance against you and do everything he can to distract you. Press on, and do not concern yourself with the things that you see or by the many dissenting voices and negative opinions of others. Do not become weary or be a faint-heart. I will strengthen, help and uphold you as you as you remain strong in your faith and become courageous in Me, says the LORD. Thank you my loving Father ❤️💙❤️. Thank You, Lord Jesus, for Your MERCY, TENDER LOVING CARE and GRACE. FORGIVE me my SINS and GUIDE me on the PATH of LIFE, hand in hand !!! Yes, I believe it! I recieve it !